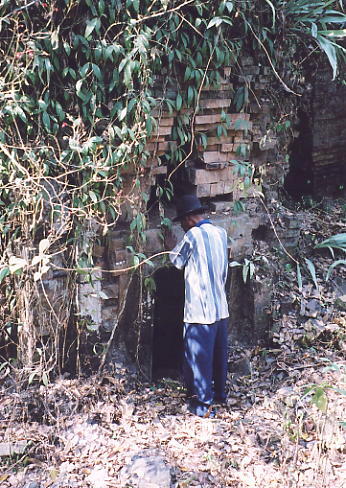 The area immediately northeast of the Phnom Kulen mountain range has a wealth of Angkorean temples waiting to be re-discovered. Armed with an old photocopied map, I visited this region in December 2003 with Rieng and we located a handful of sites, with the promise of more to see on future visits. 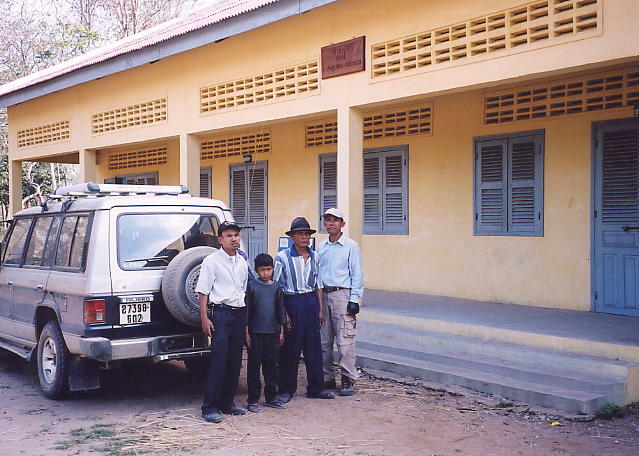 This was my first opportunity to return to the area north of Svay Leu, though the threat of landmines is a serious concern in the region, and its essential to employ the services of locals who know their surroundings intimately. On our last visit, we'd seen the temples of Prasat Svay Kabal Tuuk, Ta Dung, Kon Ko, Dangkao and La Tracie Veng, all located at the foot of Phnom Kulen and within a few kilometres of Svay Leu village. This time, with Heng in charge of the 4WD, Rieng and myself were aiming for some of the sites around the village of Ta Siem, some ten kilometres north of Svay Leu. We left the guesthouse at 7.30am, reaching Damdek along Route 6 in half an hour and turned left on the road towards Beng Mealea, which was dusty in the extreme due to road widening taking place. I remember travelling the same road five years before, when it was an enjoyable experience, unlike today's dustbowl ordeal - thankfully I wasn't on a moto this time around. At the junction with the road coming from the direction of Angkor, a toll booth collected fees to use the recently-laid, privately-funded road to Beng Mealea and beyond that, to Koh Ker. The fee is 10,000 riel per car, half for a motorbike. Fifteen minutes later a second checkpoint charges visitors going to Beng Mealea ($5) and Koh Ker ($10). Rieng eventually persuaded the policeman in charge that we weren't going to either, but it was a close call, and we proceeded onto Svay Leu, another ten minutes away. The road to Koh Ker is now in excellent condition from Svay Leu but that wasn't our destination, instead we took what I can only describe as a formidable, non-tarmaced track towards Ta Siem, only suitable for motorbikes and 4WD. It was heavily-sanded and badly rutted, we had to negotiate three steep-banked dried river beds, passing through the villages of Trapeang Tim and Rohal in the hour it took to reach our destination. For the final kilometre we drove through rice fields as the small wooden bridges along the track were broken. Heng parked up when we reached the village and went off with Rieng to find someone to act as our guide to the four temples we'd identified as closest to Ta Siem. More temples lie further north in the vicinity of the village of Kantuot but everyone we spoke to told us that the area hasn't yet been extensively cleared of landmines, so I'll leave that for a future visit. I chatted with a young monk for a few minutes before my companions returned with Tomrin and Riay, his nine year old son. 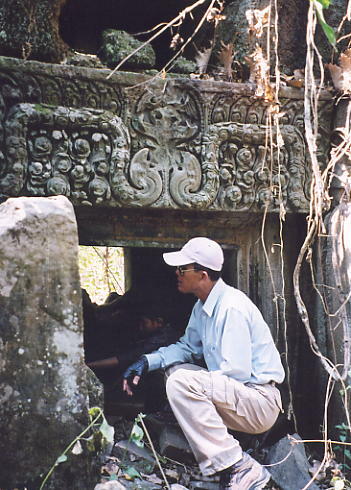 Tomrin wore a trilby hat and was sprightly for his age, which I guessed at around 60, and said he knew the way to all four temples we wanted to visit, and that they were safe. Off we went, leaving Tomrin's house at 11am and heading for the two temples of Prasat Bangkoy, some eight kilometres northeast of the village. There was a trail of sorts but for much of the forty-five minute trip we drove through forest and across dried riverbeds, without seeing a soul. 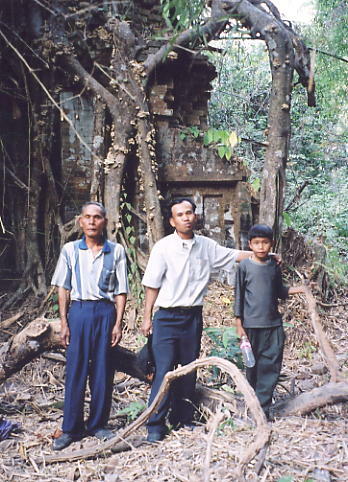 In fact the trip from Svay Leu had been notable for the complete absence of people apart from in the villages we passed. One reason why no-one was working the fields, was that most of them were showing signs of having been recently burnt, to encourage new growth. Another reason, seemingly the whole population of Ta Siem was attending a very noisy wedding ceremony, apart from Tomrin that is. He called a halt to our drive literally in the middle of the forest and pointed off into the distance. 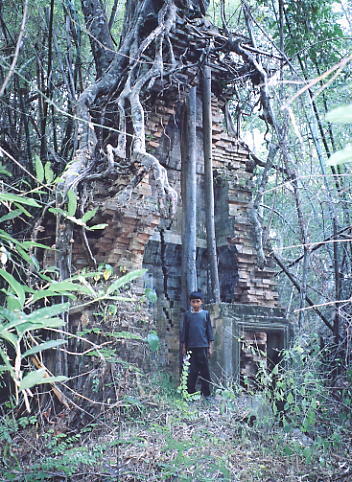 Our group of five walked through the scrub for a couple of minutes until we reached a large, sturdy laterite wall, which Tomrin announced as Prasat Bangkoy North. We entered through the eastern gopura where a four-armed Vishnu with Kala lintel was in good nick and came to two laterite libraries with brick ceilings and more carvings in reasonable condition. The centrepiece of the pediment of the eastern door was a large Hamsa, whilst two fighting figures and two Kalas adorned the western lintel. Under the forest canopy, it was extremely hot and humid, whilst fallen stone blocks demanded concentration as we wound our way slowly through the temple. 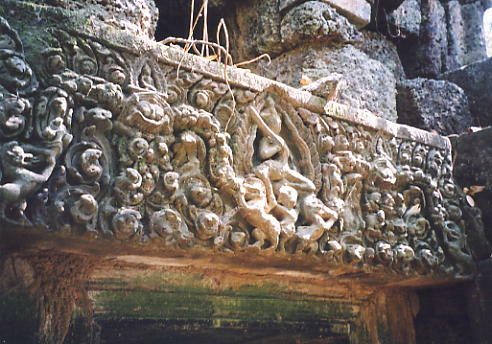 The central sanctuary was built of sandstone and contained lintels both on the outside of the entranceways as well as inside, together with some defaced Apsara carvings. 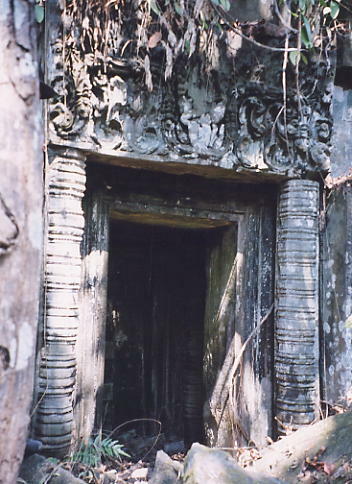 The lintel of the western door was particularly fine, with a Kala monster and two figures, one of which was upside down. 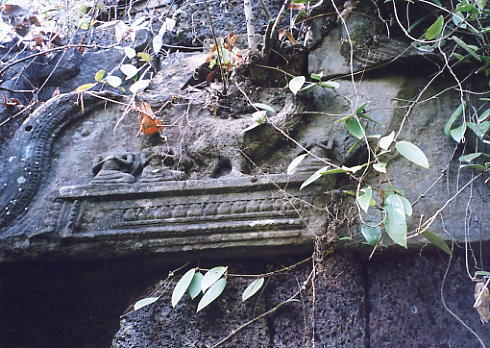 After half an hour of exploration, we exited the temple via the western gopura, with a mixed construction of laterite and brick and a nice lintel showing three lions beneath a figure holding a sword and two Kalas. 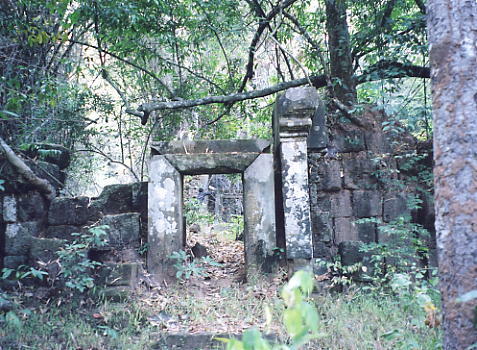 A five minute walk through the forest brought us to the sister temple of Prasat Bangkoy South and another high laterite enclosure wall. The only visible entry was up and over the wall which was a tough ask but we managed it and then dropped down into the inner part of the temple, where three brick and laterite towers stood just inches apart from each other. 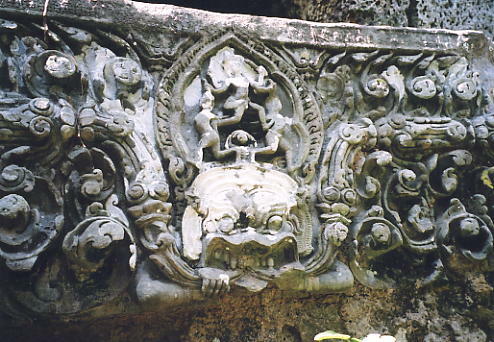 There were no discernible carvings or lintels in situ, though two large lotus buds were on the floor having fallen from the summit of the towers. There was also a laterite and brick combination library, and more red ants than I care to recall. The temple was in a far more ruinous state that its near neighbour and we found an exit via the western gopura, again with no obvious decorative features. Back at the car, Heng's ice-box came in handy for cold drinks and his boot also proved useful as we paused on the way back to Ta Siem to help ourselves to some pieces of mahogany that had been cut into covenient-sized pieces by loggers and left in a clearing. I promised not to tell anyone. At the village, we met Tomrin's wife and in the shade under his house, ate our lunch of chicken and dried fish, with the loudspeaker sounds of the nearby wedding party for company. 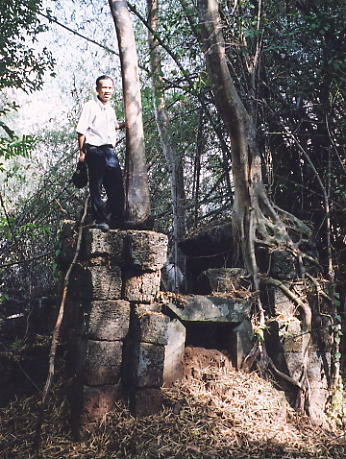 We left at 2pm to seek out two more temples, this time heading southwest of the village along tracks through the forest and scrub. Half an hour later we arrived at Kranung school, where a sign indentified the area recently demined by Halo Trust and that the single school building, shown as Kranhoung on the sign, had been erected six months earlier courtesy of a donation by the Hollywood actress Angelina Jolie. We left the car and walked through rice fields for ten minutes before entering a large thicket of bamboo, where a laterite wall announced our arrival at Prasat Kranung. The two entry gopuras were in a poor state and the main brick tower and two laterite libraries hadn't fared much better. 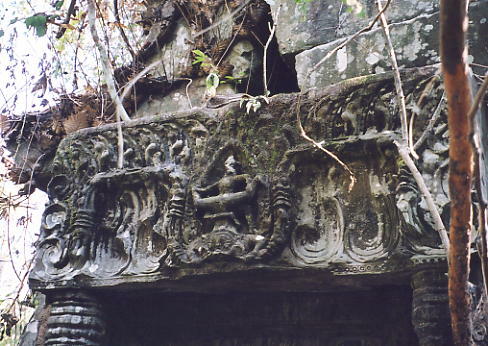 All had suffered over time and were lacking roofs and carvings of any description. The spiky bamboo and vegetation made it difficult to get around the site easily but we did manage to locate three sandstone pedestals near the eastern gopura before taking our leave and stopping off at the large baray nearby, where groups of young women were planting rice and catching frogs. A small crowd of children had gathered around our car to wave us off, as we drove to our final destination, Prasat Sre Yem. This time we had to walk a kilometre through fields before arriving at a laterite wall and an eastern gopura leading to a tall, solitary brick tower which was in the grip of a banyan tree and partially ruined. 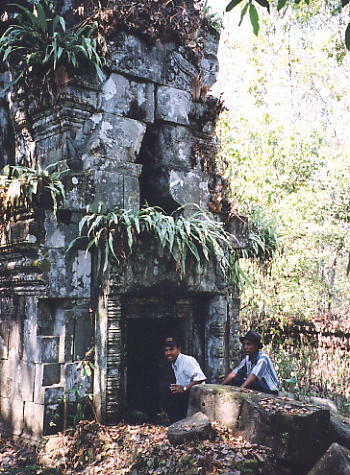 The surrounding trees and vegetation blocked out most of the sun, making it extremely humid and at the same time, atmospheric as shafts of sunlight broke through the canopy above to hit parts of the temple, as we carefully picked a path over the bricks and stone blocks that carpeted the floor. It took us fifteen minutes to walk back to the 4WD and another ten minutes to drive back to Ta Siem. I thanked Tomrin and Riay for their help in locating the temples and gave them both some cash for their time and trouble. Without their guidance, it would've been impossible to locate the temples we'd seen. Our return to Svay Leu took just thirty-five minutes with Heng again displaying his consummate skill at negotiating such a difficult track, and an hour later we were back in Damdek, finally reaching Siem Reap at a little past 6pm. At the HanumanAlaya, the receptionist Naroath smiled sweetly and told me they were full but that they'd booked me a night at the Koh Ker hotel instead, so we drove there to deposit my overnight bag. I thanked Rieng and Heng for another excellent day's temple-hunting, with the promise of much more in that same area in the future, and took a moto to the Red Piano. After eating, I bumped into Nancy Beavan, who I'd originally met on the incoming flight from Singapore and we chatted for a while before checking my e-mail next door and trying out the tikalok stall just over the bridge from the old market. Unfortunately, it was the worst tasting tikalok I've experienced throughout my time in Cambodia, so you've been warned. I walked back to my hotel just off the main highway and fell asleep at 10.30pm watching television.